The Molasses Act of 1733 was one of a series of acts of the British Parliament meant to control the trade of the North American colonies. This act along with many others, including the Sugar Act, the Currency Act, the Stamp Act, the Townshend Acts and others, caused an enormous uproar in the colonies that eventually led to the American Revolutionary War. Read on below to learn more about the history and impact of the Molasses Act. 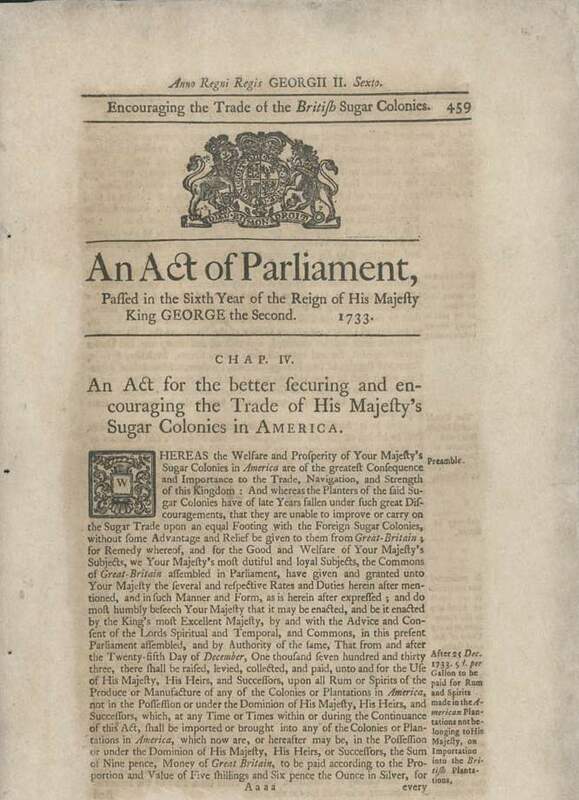 You will also be able to read the text of the Act and, for a little fun, don't forget to try out the Colonial Molasses Candy Recipe at the bottom of the page! The Molasses Act, which was officially called the Sugar and Molasses Act of 1733, was one of a series of acts known as the Navigation Acts, which sought to control the trade of the colonies in a way that would produce the most profit for England. This policy is called mercantilism and was followed by all of the colonial powers of Europe during the 17th and 18th centuries. Mercantilism was a policy that sought to restrict a mother country's colonies from only trading with sister colonies also controlled by the mother country, and with the mother country itself. By doing so, goods and revenue would be kept within the realm of the mother country, enriching the mother country and preventing any leakage of profits away to foreign competitors. In order to understand why the Molasses Act of 1733 had such an impact on the American colonies and helped precipitate the Revolutionary War, it is necessary to understand the central role of molasses to the colonial economy at the time. Molasses is a byproduct of the sugar cane refining industry and is created when sugar cane is boiled and distilled into sugar crystals. 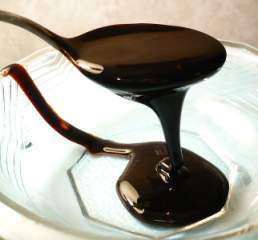 The leftover part after distillation is molasses, which was used as a sweetener in colonial days, as the main raw ingredient for the manufacture of rum and for various other industrial purposes. In fact, molasses was the most important sweetener in the United States until the 1880s, because it was cheaper than refined sugar. 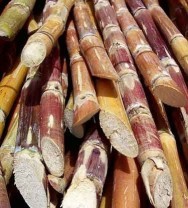 Sugar cane was grown in large quantities in the British colonies in the Caribbean West Indies, especially in the islands of Barbados, Antigua and Jamaica. 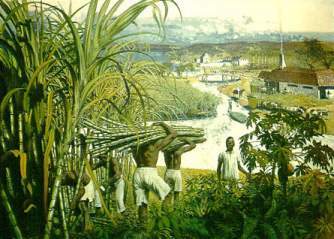 Sugar cane was distilled in the West Indies and the crystals were exported back to Europe. The remaining molasses was either distilled into rum or exported to the mainland colonies where it was also distilled into rum. Keep in mind that these Caribbean islands were also British colonies. So trade between these islands and the colonies on the North American mainland was inter-British colonial trade. The manufacture of rum was a huge industry in the colonies at the time. It was consumed at a rate of four gallons a year for every man, woman and child. This was actually one of the largest industries in New England. The city of Boston alone was already producing more than a million gallons of rum a year by the 1730s! Not only was the manufacture of rum distilled from molasses an important industry in itself, but it was also intricately tied into every other important industry in the colonies. All colonial trade around the Atlantic Ocean was tied together around the transportation of goods from one place to another. Major trading areas included North Africa, Southern Europe, Northern Europe, England, North America, the British West Indies and the French West Indies. Many triangles of trade existed between these various areas. For example, slaves would be transported from North Africa to the West Indies. The slaves were sold there and the merchants would buy molasses, sugar and rum. These were then transported to the North American colonies where they were sold for the cheap manufacture of rum. The rum was then purchased and exported back to Africa and traded for more slaves, beginning the process all over again. Triangles of trade existed between many different colonial areas controlled by Britain, France, Holland, Portugal and Spain. Money that was accumulated in America from this trade was used to buy manufactured goods such as cloth, furniture and hats from England. All of these industries were intricately tied together and supported one another. A collapse in one industry or a price surge in another, a surplus of goods in one colony or a new trade restriction by a colonial power, had wide ranging ripples throughout the entire Atlantic economy. Secondly, the French planters were forced to sell for lower prices because of a law in France that prevented them from exporting rum or molasses back to France, or from making rum at all. France had a very large domestic brandy making industry and in order to protect its brandy manufacturers, they prohibited the import and selling of rum in France. This made French sugar cane manufacturers more desperate to find willing buyers for their products so they lowered their prices. In addition, since the restriction on selling molasses to France put the French planters in a bind, the French government tried to create a market for molasses by making a law stating that New England fish could only be paid for with molasses! Why would they do that? Fish from New England was a huge import into the French islands, so the law created a market for molasses by force! Colonists in North America of course bought the cheaper and superior molasses from the French West Indies, practically shutting out sugar cane manufacturers from the British islands. The colonists also had another incentive to trade with the French islands, instead of the British islands. The British islands had no use for the lumber, fish, flour, cheese and other goods that were the main exports of the colonies. They already had these in abundant supply. The French islands however, desperately needed these things and were eager to buy as much as the colonists could ship them. The colonies were also desperately in need of a market for their grains and livestock. Why? British law forbade them from selling these to England because these items were produced in great abundance in England already and Parliament wanted to eliminate any colonial competition to these home grown industries. See how complicated and intricately interwoven all of these industries were? All of this precipitated an outcry from the British West Indian plantation owners to Parliament. They asked for laws to be passed that would prohibit the other British colonies from importing sugar, molasses and rum from any foreign countries. This would force them to buy these goods only from the British islands. At the time, the economic power of the mainland colonies was not fully realized and trade with the West Indies was considered to be of more importance to the empire. In addition, the island plantation owners had powerful allies in Parliament. The result of their outcry was the Sugar and Molasses Act of 1733, which did not prohibit the importation of foreign molasses into the American colonies, but instead placed a heavy tax on the foreign goods in order to force the colonists into buying cheaper goods from the British planters. The act also placed similar restrictions on the important of the same goods into Ireland for the same purposes. You can read the complete text of the Molasses Act by clicking on the link at the bottom of this page, but know that the Molasses Act is quite long and difficult to understand. You would be advised to read the rest of this article for an explanation first! You can read the complete Molasses Act text here. Had the Molasses Act ever truly been enforced, it would have wreaked havoc on the colonial economy. It would have decimated the New England rum industry by making the prices of raw materials for its production enormously high. The elimination of the French West Indies markets for colonial lumber, fish, cheese, flour, barrels and horses would have destroyed one of the primary markets for a huge portion of colonial exports. If these major sources of revenue were removed, the colonists would have had less money with which to purchase manufactured goods from England, destroying retail markets for finished goods in the colonies and manufacturers back in England. But notice that we said if the Molasses Act had been enforced, it would have destroyed the colonial economy? Why didn't the Molasses Act actually have such a harmful effect? Smuggling! Right from the start, the colonists developed ways of getting around the new law and evading efforts to enforce the act. The colonists immediately developed trade routes and rendezvous points with French, Dutch and Spanish traders. If they had traded for molasses, sugar and rum only with traders from the British islands, the prices for these items would double or even triple! It was much cheaper to buy from the French! The British sugar islands couldn't produce enough molasses to fuel the huge demand from the mainland anyway. So the colonists were forced to seek it from other sources. The colonists developed a myriad of ways to get around paying this tax. They could rendezvous with the ship at some other location from the port and unload the goods away from prying customs officials' eyes. They could change the markings on goods and ships to try to conceal their origin and trick the officials into thinking they were actually British goods. Many traders bribed customs officials to overlook the origin of the goods or declare them to be British goods when they really weren't. They could pay the custom official a penny to turn a blind eye and save five cents a gallon! The official would pocket some extra money and the merchant could import his molasses at a cheaper rate! This smuggling and breaking the law continued for the next 30 years. Understanding this smuggling and bribery is a key to understanding the American Revolution. Why? Because it encouraged the development of an attitude of resistance toward unpopular laws passed by the government in the colonial population. The government was seen as an instigator, as heavy handed, as greedy, and this view became entrenched in the colonial mindset. It also caused a large and all encompassing economic system that existed outside the confines of British law. It caused the colonists to see that they could survive and prosper without relying on England. The first shots of the American Revolution would not be fired for another 40 years, but the mindset of independence and rebellion against unjust government that caused the Revolution, was developing and becoming entrenched for all those years. It was not anger about tea that started the seeds of the American Revolution growing, but anger about rum! The smuggling trade for sugar, rum and molasses was so huge that five sixths of all the molasses imported into the colonies came from the French West Indies instead of from the British islands. Huge fortunes were made by colonial merchants in the colonies from smuggling, allegedly including John Hancock of Boston, although this has never been conclusively proven. 30 years later the British would detain his smuggling ship called the Liberty and this event would be one of the triggers of the Boston Tea Party, one of the most significant events leading to the Revolutionary War! 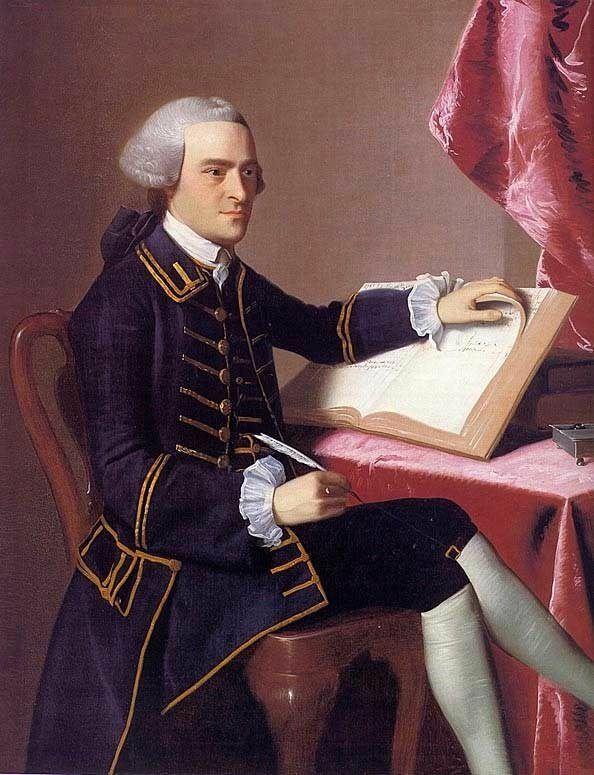 Of course John Hancock later became one of the leaders of the Revolution, becoming President of the Continental Congress, the first (and largest) signer of the Declaration of Independence and the first governor of the State of Massachusetts! The British made some cursory efforts to enforce the Molasses Act early on, but eventually their efforts waned and the act was never strongly enforced, even though it was renewed every five years for the next 30 years. Why didn't they enforce it? They realized what a detrimental effect it would have had on the entire British economy. 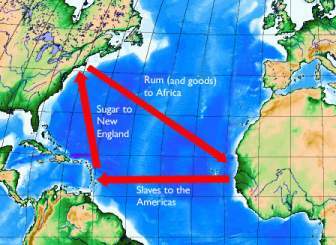 As was mentioned above, the molasses trade was intricately tied to every aspect of trade around the Atlantic. The harm caused to the colonial economy by enforcement of the Molasses Act would ripple throughout the British economy, hurting the trade in manufactured goods, slaves, cotton, gold, silver and on and on. Parliament realized that the narrow interest of its West Indian colonies in providing a forced market for their goods did not serve the wider interests of the British empire. By allowing the law to go unenforced, Parliament was allowing the colonies to continue to prosper and to continue to supply raw materials to the rest of the Empire and provide money rich markets for manufactured English goods. Simply speaking, every more expensive barrel of molasses imported into the colonies from the British islands reduced the amount of money the colonists had to spend on goods manufactured in England. Lax enforcement of the Molasses Act also ended up having a beneficial effect on the British West Indies. Since they couldn't sell their molasses to the colonies they began to produce their own high quality rum and sell it back to England and Ireland! In short, no one had a real interest in prohibiting the cheap sale of French molasses to the colonies. England tried to get tighter control over the colonial economy for its own advantage with the Molasses Act. Along with later acts, including the Proclamation of 1763, the Currency Act, the Sugar Act and the Stamp Act, the Molasses Act helped pave the way for the American Revolution. Read the text of the Molasses Act here. And for a little fun, you can get the recipe for a colonial molasses candy treat here! This article is the first in a chronological series of articles that explain the causes of the Revolutionary War. Follow the link to read about subsequent events leading up to the American Revolution.